Another post-modern mix of myth, musical, comedy, romance and unfettered pastiche from the impressively inventive Luhrmann, here ransacking pop culture's iconographic archives - rather than the real Paris of 1900 - to mount a hyperkinetic update of the Orpheus myth. Naive, lovelorn writer/composer Christian (McGregor) is taken up by bohemians like Toulouse-Lautrec to put on a show at the scandalous showplace of the title, where courtesan/torch singer Satine (Kidman) will do anything - even sleep with a dodgy Duke - to further her acting career, especially if pressed by the club proprietor (Broadbent) - until, that is, she meets Christian, and her heart melts. A Red Shoes-style fable of love and art in conflict with commerce and power, it's luridly stunning to look at even if it's cut a little too quickly and insistently for its own good. It's also jam-packed with allusions and gags, and performed with enormous gusto. If it lacks the emotional punch of Luhrmann's earlier films, and drags towards the end, it is still great fun. Wow, this is a stunning film.. worth watching multiple times and I am not a fan of musicals. The visuals are superb, a high-concept realisation of a classic story. The acting is strong and the signing just brilliant. Who knew that they had it in them? I bought the CD, nope hold on I bought both CDs and I could listen to them now, again, and still enjoy them. A really fun romp; great to watch on a Sunday afternoon at home; but if you can catch it on the big screen then catch it! This mash up of music, stories and styles sounds nuts on paper. Baz Luhrmann is however just the man to bring it all together in stunning fashion and produce this incredible film. Its a musical, its a love story, there's danger and someone dies. Set to a sound scape of David Bowie, Beck and the stars of the show, Nicole Kidman and Ewan McGregor, its pacey and exciting throughout. Although we knew tragedy was coming for the lovers I was genuinely choked up at the end. If love cant last between a writer and a courtesan in a giant elephant in Paris, where can it? HARD TIMES FOR SATINE Christian is a penniless writer. 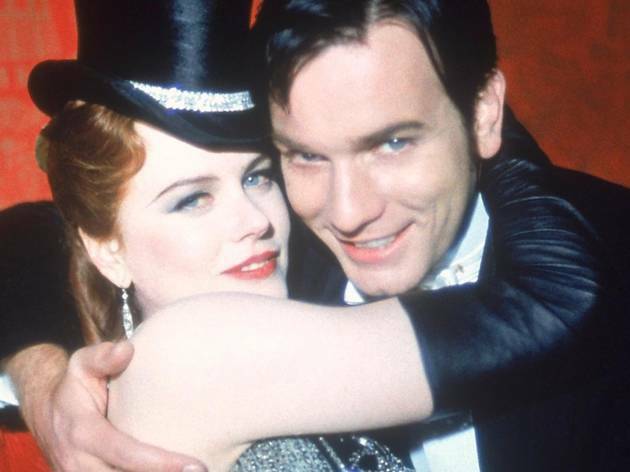 He comes to the Moulin Rouge and meets its star Satine. She thinks he is rich and starts to seduce him, then she knows the truth and changes idea. Toulouse-Lautrec, Bohemians' chief, enrols Christian in their club to write their plot. The Satine's manager has already enrolled the star in his club. Finally, a true rich gets but satine has fallen in love with Christian. Tubercolosis has the last word. In "La Traviata", Violetta tells her love has been defeated only by her illness. In "Moulin Rouge", Satine seems to be defeated by something else. This movie has had audience and Oscars. Its plot is modern though there is the old Can-Can in the background. Maybe this dance is too wild, but is representative. Well, there are also another dances.